Why is obrien setting the G5 up with the wing, blade side towards ski? Ron Smith Invermere BC Canada. Ski at Rons lake Ta Ta creek BC. I have 2 Conquers, and both were shipped to me with the wing blades down and away from the ski. Something tells me its purely a mistake, or could have something to do with the ski hunting for an edge. My guess is uneducated, but experienced? Is that possible? When you have non skiers working the assembly line in China........ Just kidding, but I bet the workers are not industry involved and are going by the training manual. I think a few Australians must have been employed in the quality department. did some inquires and obrien is recommending that the wing be mounted blades toward the ski. Have had countless discussions about this with friends....surely blade closest to water is best? @whitem71 -no one knows better than your friends. oh wait -may be kris la point knows a little bit better than your friends. back in mid -1990's he wrote about fin placement and imo it should be included in the tech articles on this site but so far isnt. somebody alert @Horton. Moving the wing toward the rear (putting the trailing edge of the wing about 0.5 in. From the rear of the fin blade) pushes the ski out in front of you in the turn and makes the ski finish the arc more quickly. This is especially good if your ski tends to finish behind you at the end of the turn. At least you think you're funny @colo_skier . I guess people didn't understand the reference to the wing being upside down. In these were meant for sales below the equator. Nothing to do with abilities or nationalities. Thank goodness people didn't see my comment about the Irish Olympic swimming trials. 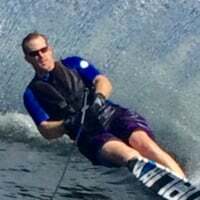 @colo_skier did drinking beat waterskiing into the Olympics ?